For years I’ve wished Waukee had a coffee shop you could easily get to by bicycle. TAAADAAA!! Never mind that horrible parking job. Look at those tasty specials! Productive gardens run on coffee. Grounds that is..
Waukee has a new tunnel along the Heart of the Warrior trail providing a safer crossing of Alice's Road. Heads up though. It's safer but weather permitting. 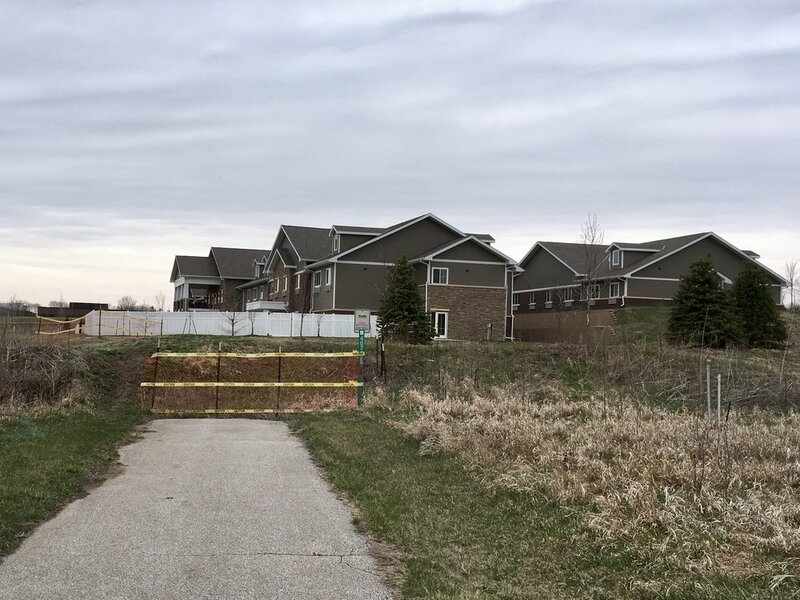 Like the trail tunnels of West Des Moines, this one will prove to be problematic when it rains filling entry points with water and/or when snow has melted and then refroze. Approaching from the West I dismounted and very slowly shuffled my way across the ice. Inside the tunnel was dry and the walls graffitied. The Eastern side was patchy with snow, ice, and big puddles thanks to the water coming down the wall from overhead. It will be great to have this tunnel on dry days, but I'm bummed about it being suited for fair weather. This weekend I rode over to Centennial Park to check out the Waukee Art Festival. It was nice to find others having done the same. The bike rack was full so I joined in on the DIY parking. The barn pictures were cool. Prior to my ride I used the search feature at LittleFreeLibrary.org to locate these small collections and then determined the easiest way (minimal traffic interaction as possible) to get there by bike. The first one I visited was in need of some repair with the door of the the box missing. I decided to skip this location as a donation spot. Hidden by mailboxes a very cheerful library was painted in a few of my favorite colors. It was in desperate need of books so I left two behind. As much as I wanted to tidy the shelves, I let them be. A elementary teacher is the steward of the large educational themed library built by her husband. It was my favorite. Inside was a note inviting kids to use the sidewalk from the shelf and draw on her driveway and sidewalk. How cool! As a former teacher and library, this bike ride was especially fun, and would be for anyone who loves bikes and books. A ride to the libraries would be also be great for families with young kids or grandparents out with the grand-kids. Go for a ride. Take a book. Return a book. Foster the love of reading AND biking in one outing? Now that's Happy Riding!